This book is meant to provide an overview of the state of the art of hemodialysis. 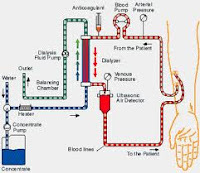 The pace of acquisition of new knowledge in hemodialysis is fast and the goal is to bring a thoughtful, well organized exposition of this burgeoning knowledge base to the readers. Each chapter has been thoroughly revised and updated and the readers will become acquainted with the latest thinking in some of the most important topics in hemodialysis. The book is comprehensive and not limited to a partial discussion of hemodialysis. Chapters pertaining to nearly all aspects of the care of dialysis patients are included. To accomplish this we are pleased to have been able to assemble a leading panel of expert contributors who have been challenged to summarize state of the art knowledge in each chapter of the book. We wish to thank each author for taking considerable time and effort to ensure that each chapter provides state of the art information. We hope that readers achieve the same level of acquisition of new knowledge and enjoyment as we have attained by editing this book.